Facebook is at it again, yesterday they rolled out their new business pages so here is an update on what the changes mean and how we are going to implement them for our clients. Facebook as a way of changing things around on us without asking if we want changes (imagine that!) Overall I have to say that I am positively giddy about the changes that they have made and as it looks like we are going to have switch by March anyways, let’s dig and see what they have been up to this time! Note: As we always tell our clients, FACEBOOK owns our pages and all the content, period the end. With this in mind, it is super important to keep up with the changes that they make BUT also important to know that things could change at the drop of a dime so you have to keep up with them as they happen! My FAVORITE Facebook Business Page Change! While most of the changes seem to be more cosmetic than anything, allowing us to comment on our own pages as a human is my absolute favorite! I have a feeling that this one is going to increase the amount of interaction that happens on the page! As people, we are more inclined to find comments by humans interesting rather than the page itself adding to the conversation. 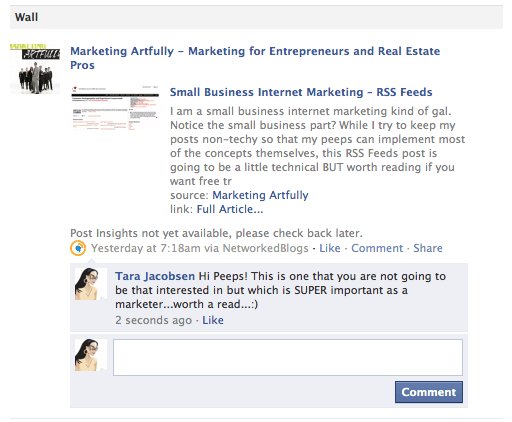 As you can see, I am logged in as Tara Jacobsen, making a comment on my Marketing Artfully page and it shows up as my person rather than just another post by the page. For social media types this is BRILLIANT as we can now make ourselves admins on the page again so that we can comment on our clients posts as something other than the page! You are going to have to go into the settings of your page and UNCHECK the box next to “Always comment and post on your page as PAGE NAME even when using Facebook as YOUR NAME”. This one is a little trickier! Now you can comment on another business page as YOUR business page. Again, I can only think that this will help us as it will get more people to check out your page when you make insightful comments on OTHER pages. 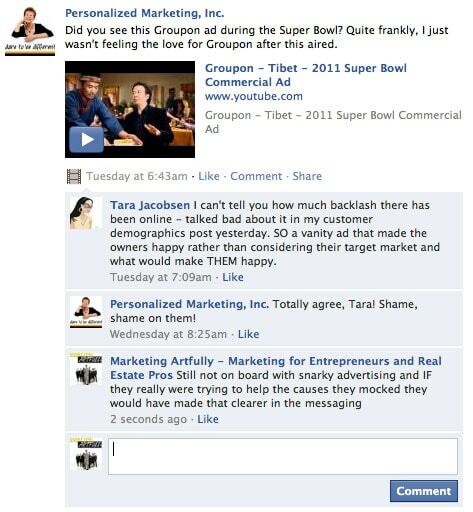 As you can see on the left, I made a comment on Personalized Marketing’s business page as both Tara Jacobsen (the person) AND as Marketing Artfully (the business page). I suggest using this feature to comment on pages in complimentary industries (Realtors can comment on Home Inspection pages, Pet Sitters can comment on Dog Food Pages). DO NOT use this for evil and hijack someone else’s page, BUT as a marketing tool, STELLAR! To make this one work you have to have done Step 1 and made your commenting on YOUR pages done by your human. Next you are going to have to go to the top right and select “Use Facebook as a Page”. This brings up a whole list of the pages that you admin for, simply select the page that you want to comment as and you are set to go! A couple of things to note, I had to “Like” the page as my page before I could comment AND it was super easy to switch back to being “Tara Jacobsen” instead of Marketing Artfully. I just clicked account again and it gave me the option to go back to being me. Featured pages – If you go into your “Edit Page” mode, you will see Featured Pages which allows you set the other pages that you like. 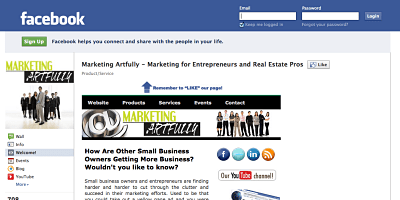 Make sure to feature your friends’ pages, business partner pages and clients. Featured page owners – You know how it was impossible to show who owned the page, no more!!! 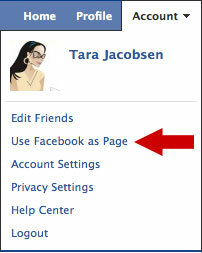 Now you can just set the owner as the human who owns the page. Left Navigation – To move the left navigation around, just click edit and it is a drag and drop. As the top four only show, I suggest adding your notes, YouTube, event and your blog. All things humans might be interested in about you. Custom Facebook Business Pages – This was a big one for me, I was worried that these were going away but the work perfectly! New people to your page still see the pretty landing page, old likers see the wall. If you are a small business owner and think this is all too much to take in, just know that our client didn’t have to lift a finger today, we did all these changes for them! Find out more about our Social Media Marketing Services today! Wow, Thanks for being on top of this! You made it very understandablenad easy. Hi Tara – Thanks for the great article, I already have it saved to my “Favorites” so I can refer to it in the future 🙂 I also really like being able to comment on pages as your business pages – exposing that many more people to your business, I think it will be really effective.